2 So, What is a Swing Set? You have heaps of choice for swings sets for small kids, but it dramatically narrows down as your child gets older. Which is why, I have dedicated this article today in quest to find you some of the best swing sets for older kids. I will introduce you to some of the most top-rated and popular swing sets from some of the best brands in the market. You will be given a consumer-smart buying guide along with comprehensive reviews of 5 assorted swing sets. Let’s start off with a little 101 on swing sets. So, What is a Swing Set? A swing set, as we know it, is a framework made out of either wood or metal which houses one or more swings from it for kids to play on. However, as time went on and modern swing sets arrived, consumers are being offered more than just swings. We can now enjoy other activities like sliding, climbing and even hanging! But one problem that prevails even it modern swings sets are that they are often targeted towards smaller kids. But that what I’m here to fix today. Let’s look at what to look for in swing sets for older children. Looking for best swing sets for toddlers? Click ﻿here﻿! Older kids equal more weight plus more movement. Needless to say, you have to pay extra attention to the stability and gripping power of the swing set you choose. Although free-standing (playset that do not need cemented for anchoring) are great and fuss-free, you still may want to opt for a set that offers you stakes or other anchoring accessories; just to be on the safe side. Better safe than sorry, don’t you think so too? Yes, yes, bigger doesn’t always mean better but there are exceptions, always! Although your kid could be having just as much fun swinging on a very simple and basic swing set, I would recommend you still bother to get one a little bit more XL. No, it doesn’t have to be diamond encrusted one, in fact, something as simple as Outward Play Holt Wooden A-Frame Swing Set will do too; what you have to make sure of however, is that it is spacious, roomy and longer in height. What you have on your hands are a group of growing kids. So, it is always advised to get something they can play with for hours comfortably, and eventually for years to come! People choose wood, primarily, because of its appeal. It has a very vintage and nostalgic vibe to it and look beautiful everywhere. However, wooden swing sets are more vulnerable to weather damages. Having said that, woods are now being chemically or UV-treated to resolve this problem. Metal swing sets are far more durable and inexpensive than the wooden ones. However, they have a tendency to rust and corrode. Look for powder-coated metals on your swings too. Unlike little children, the older ones get bored, fast! Get a swing set that has enough activities to keep them entertained long enough. Or if you have a low budget, pick a simple set that can be accessorized with new additions like chalkboards, spotting scopes, etc. We thought we’d start the list with something a little more minimal and simple with the Holt Wooden A-Frame Swing Set from Outward Play. The Holt Wooden A-Frame Swing Set is made out of fine New Zealand Pine wood and features 2 wings which are both height adjustable. The swings are positioned in a wide-based, A-frame structure that provides much-needed stability for older kids. Speaking of which, the swing have been designed to takes on weight of up to 150 pounds in total and recommended for children from 3 to 10 years of age. The Holt Wooden A-Frame Swing Set is UV-protected to prevent damages from the rough outdoors and its damages. It’s a basic framework so assembling it is likely to be a piece of cake too. 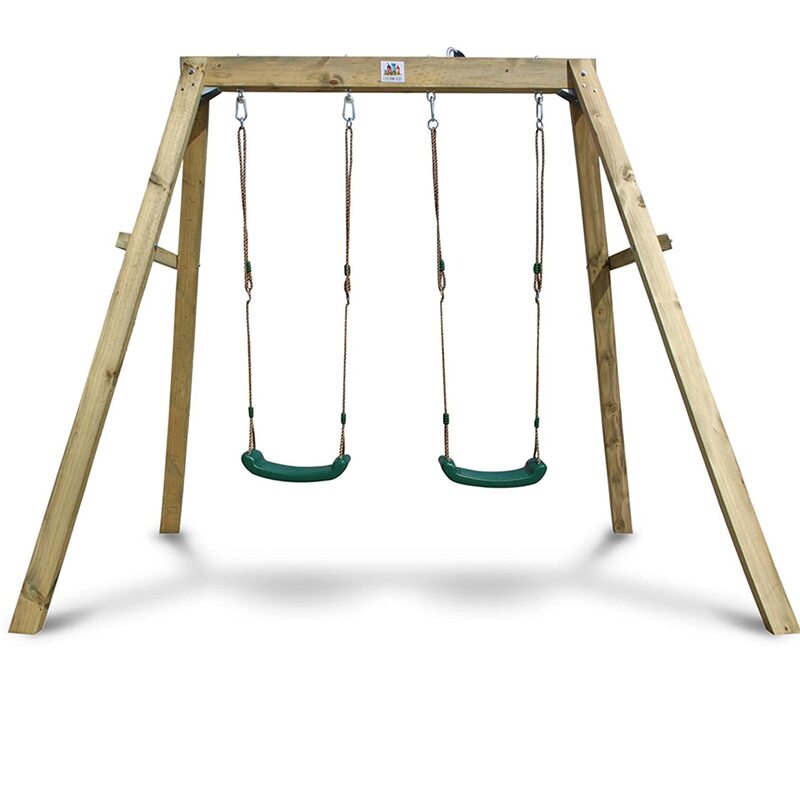 One very neat feature of the Holt Wooden A-Frame Swing Set is that it is soans more in height than width; measures 91.7 x 60.2 x 80.3 inches in dimensions. This means it can be assembled and placed in a yard with very limited space! Second up for the being one the best swing sets for older kids is a playset that is ideal for your future and up-coming Olympics gold medalist. It is the Premier 100 ﻿﻿﻿﻿Fitness ﻿﻿﻿﻿Playground from IRON KIDS.The Premier 100 Fitness Playground showcases a 3 sun-protected swing set with a total of 3 swings: 2 normal swings and 1 trapeze bar swing for hanging. You have a long, slipper slide to as well in the set. 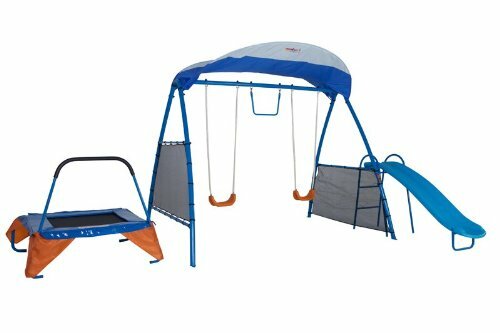 But what truly steals the limelight in the Premier 100 Fitness Playground set is the 42” trampoline you get with it! The set uses corkscrew-shaped ground stakes made of steel to establish stability and grip for when the older kids play on it. The u-shaped arch structure also helps to prevent movement during use. It goes to show goes reliable the framework is when the Premier 100 Fitness ﻿Playground offers you a lifetime warranty on the frames! Pre-teen kids often get lazy or homebound thanks to their gaming consoles and the TV. This set is undoubtedly the best swing set for 10 year old kids to get them to get out and break a sweat! The 3rd contender on our list is the Tower Playset from Lifetime Adventure. This multi-function swing set has a total of 3 swings: 2 normal and height adjustable swings and 1 monkey bar or trapeze bar swing. And beside it is the main attraction of the entire set: a tower! It can be accessed by climbing on the rock wall or by the ladder on the other side. The tower is complete with a steering wheel in it and a sun-protective roof over it. 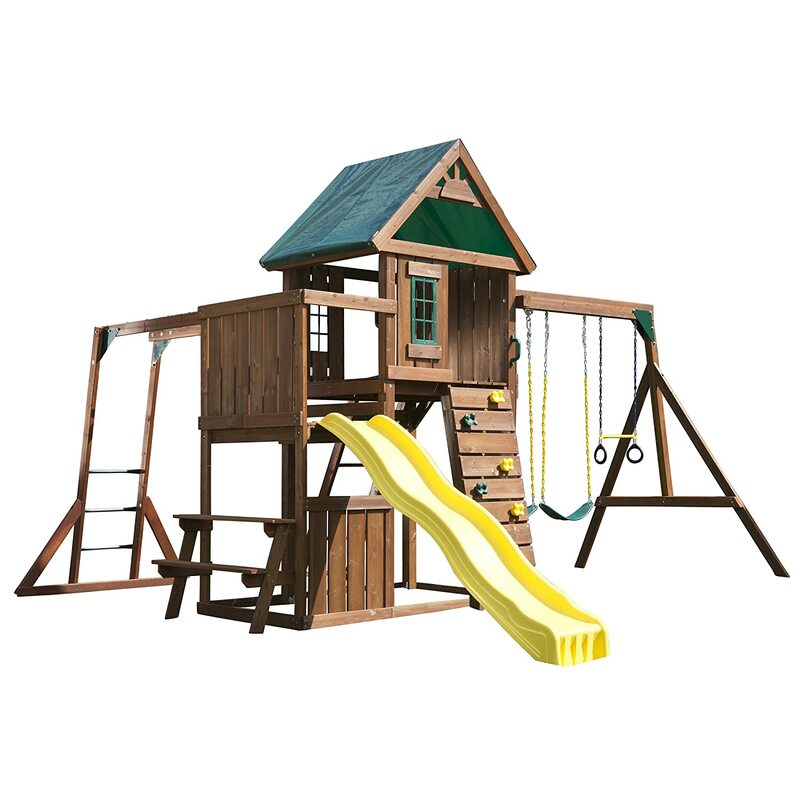 Slide down the wavy, 9-foot slide and run inside the secret room under the deck for your top-secret meetings.The Tower Playset has coated metal, is made UV-resistant, weatherproof and childproof. The Prairie Ridge from Backyard Discovery is the entire package. It is loaded with heaps of activities and sports all under one roof and can accommodate several children at once! 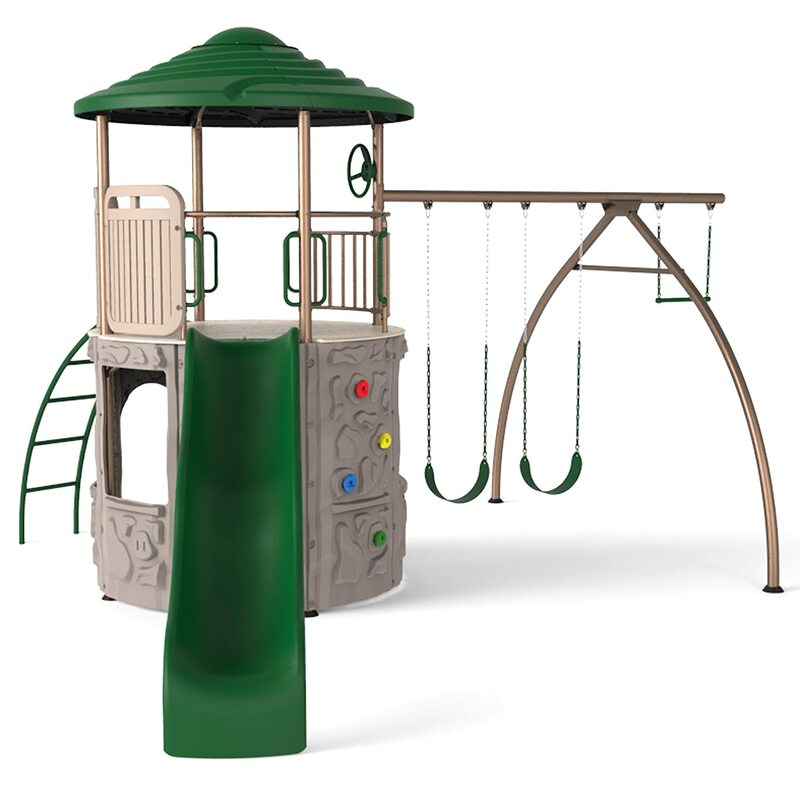 The Prairie Ridge is a multi-functional playset which features a total of 3 swings. You get 2 swings and 1 2-person glider swing. Beside it, you have a roomy and spacious clubhouse complete with windows and a sun-protective roof. Enjoy some after-work snacks and drinks on snack stand below the deck. Then climb back the ladder of the rocky wall to the slide and slide down the 8 ft slide. Or sit and create castles on the sand box that can accommodate up to 350 pounds of sand! You also get a monkey bar from a stand-up ladder too! The Prairie Ridge is weather-resistant, durable child-safe and ASTM passed too. If you are willing to spend a few extra bucks on a swing set that is large and generous, then the Chesapeake Wood Complete Play Set from Swing-N-Slide is one of the best swing sets for older kids. The Chesapeake Wood Complete Play Set features 3 total swings: 2 adjustable swings and 1 trapeze bar swing; each supporting 250 pounds. You have a double-clubhouse which you can access form the ladder, rock wall or even the monkey bar! The deck is covered with windows and a protective roof as well. From there, you can slide down the long, wavy slide; strong enough to support 250 pounds. 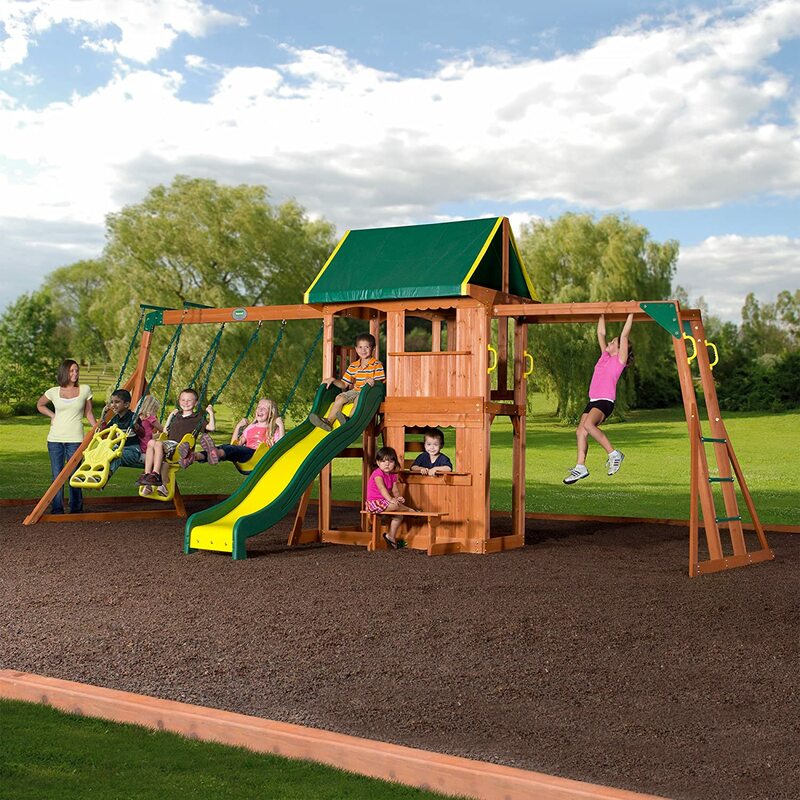 The Chesapeake Wood Complete Play Set passed ASTM standards, is childproof and weather proof, and offers a lifetime warranty against cracks and breaks! And at the end of our article today, you problem has been solved! Finding swing sets for older children is no longer a challenge for you. I have compiled some of the best swing sets for older kids with guide and review so that you are able to pick the perfect one within your likeness and budget. Hope you enjoyed and learned something reading through the articles. For any further details on the reviewed swing sets, please follow the link they come with. Good luck!